← We sold stories to the press – what happened next to these entrepreneurs? 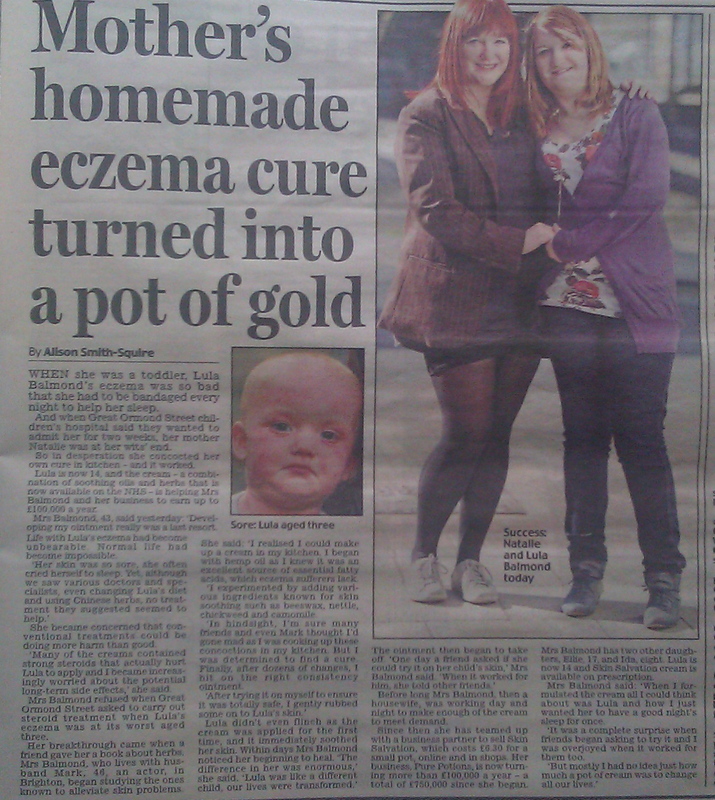 Natalie Balmond’s inspiring real life story of how she cured her daughter’s eczema with a pot of cream she cooked up in her kitchen appears in the DAILY MAIL newspaper today. Natalie Balmond approached me as an inexpensive alternative to employing a public relations organisation to raise awareness about a cream she concocted to cure her own daughter’s painful eczema. Lula was just 18 months when she developed sore red patches on her body. Although Natalie tried dozens of treatments – including strong steroid creams and diet changes – nothing worked. And her condition worsened until aged three Great Ormond St Hospital wanted to admit her. Natalie was at her wit’s end when a friend gave her a book about herbs and she realised she could make her own cream. After months of trial and error she finally hit on a formula of hemp oil, nettles and beeswax and incredibly when she smoothed it onto Lula’s skin, it worked. Soon friends were asking her to make pots for them. Eventually, she began selling her cream and now her company, Purepotions is not only turning over £100,000 a year but the Skin Salvation cream is prescribed by doctors on the NHS. Natalie is set to get even busier as she and Lula will be appearing on ITV’s Daybreak later this week to discuss their eczema cream invention.